A condition in which bones became weaker and brittle, such that a fall or even a mild stress such a bending over or coughing can cause a fracture. Osteoporosis-related fracture most commonly occur in the hip, wrist or spine. Bone is a living tissue that is constantly being broken down and replaced. 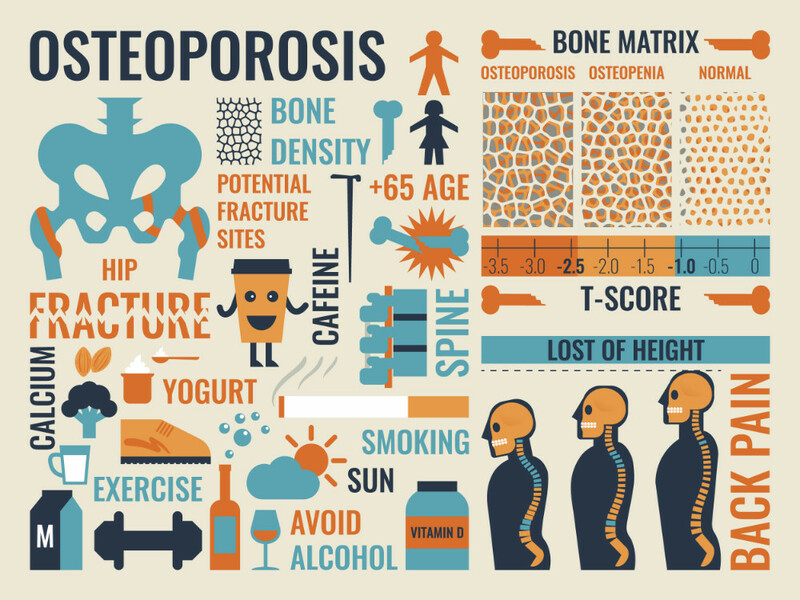 Osteoporosis occurs when the creation of new bone doesn’t keep up with the breakdown of old bone. Osteoporosis affects both men and women of all races, but seem to target more Caucasian and Asian women, especially those past menopause. Taking into account the natural wear and tear of bone plus increased risk, it is important to maintain a balance of breakdown and new production so as to help prevent weakening and brittle bones that lead to fractures. Diet and exercise are very important factors in this healthy balance that help stimulate hormones and other key factors necessary to proper maintenance. For this reason, we will begin with a complete history, assess lifestyle habits that include diet, exercise sleep, detoxification of the body, medications/supplements, mental/emotional state and lab work to determine what may be contributing to weaker bone structure. Often we will incorporate a detox program that will enhance detoxification, improving organ function as kidney filtration while at the same time deceasing inflammation and pain associated with many chronic diseases. It is important to note that as we remove obstacles that hinder proper function, we will begin to see great improvements. Based on the results, we will make necessary adjustments where appropriate for healing and restoration of proper body function. Though at times such medications as Fosamaz, Atelvia, Boniva and Reclast, may help decrease the breakdown of the bone, there is much more that can be done to help your body overall to strengthen and maintain; often times without the use of medications that include many side effects. For this reason, we will also address the function of other glands and holistically balance all, utilizing herbs, dietary changes, supplements, acupuncture and/or other methods for optimal function.